This potential is being realized in a new and groundbreaking initiative focused on solving Kentucky’s most invasive health issues, such as diabetes, obesity, drug use, and heart disease. Kentucky is currently ranked 45th in overall health in the U.S., and these issues are impacting the social and economic growth of the state. The state suffers from high rates of preventable deaths and a life expectancy below the national average. In 2015, the Kentucky General Assembly approved $265 million for the university to build a multi-disciplinary health science research facility. The facility would bring together research and a variety of disciplines to solve these problems. The university envisioned a massive building filled with wet labs for research. In fact, university leadership initially wanted 100 percent of the labs to be wet labs. During the design process, HGA, in partnership with Champlin Associates and Jacobs Consultancy, asked the university to tap into what was at the heart of many of these health issues they were trying to solve. They found that many of the causes were not just medical-related. Diabetes, for example, is a medical issue, a nutritional issue, and a socio-economic issue. University leadership found that all the health problems the research building intended to address are complex diseases that require several different disciplines working in concert to develop solutions. The university and design architects realized this facility would be far more interdisciplinary than originally thought. What does resolving big health issues entail? How do the trends in research affect design? How will the university’s money be used today? By thoroughly understanding the University of Kentucky’s needs, the design team guided leadership through design solutions that were drastically different from the University’s original vision. A building with 100 percent wet labs did not support comprehensive problem-solving research. 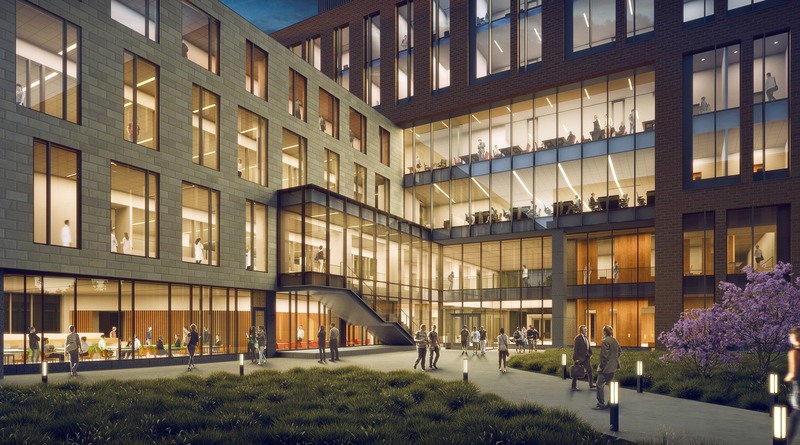 By shifting the vision to an interdisciplinary solution that combined research lab types, the University of Kentucky would be able to expand the number and type of potential users and tenants. The programming was adjusted to be two-thirds wet labs and one-third dry labs and computational space. This major change would allow scientists to work next to nutritionists, economists and other diverse researchers to tackle health issues from every angle. The dry lab space also tapped into a major trend that the university’s peer institutions were already embracing: More and more research is computational, analyzing and synthesizing data, and allowing for ideas and discoveries to be networked across institutions and geographies. By including computational research spaces, the project became much more future-focused than was originally intended. This decision elevated the facility with peer institutions and further supported the shift to problem-based research that is at the crux of interdisciplinary research. The decision also freed up money to be used in other parts of the project. Building dedicated wet labs is expensive and space-intensive. The integration of disciplines and research types created highly flexible layouts that promoted more communication. The design team organized the labs into neighborhoods that allow cross-fertilization of ideas, and this resulted in a larger number of researchers inhabiting a smaller amount of building. That meant that the University of Kentucky got more program than they thought they could have in the building, and allowed for the inclusion of other key interdisciplinary facility components, such as shared spaces. 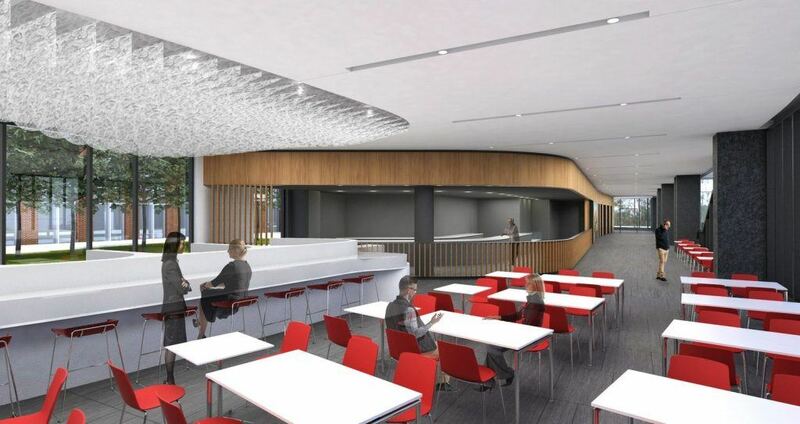 As part of the vision, the design team wanted to incorporate a cafeteria and other physical opportunities for researchers to meet. With a building that was 100 percent wet lab, the budget would not have been enough to include these amenity spaces. As the design moved to a mixture of spaces, the university could fund significant public open spaces, such as a cafeteria, public corridors that put research on display, and other social gathering spaces that support the chance of spontaneous collisions that are so necessary for interdisciplinary discoveries. The inclusion of a cafeteria also sparked the idea that all spaces could be a laboratory. Throughout the visioning and workshop process, the idea of a cafeteria became a place to study eating habits and choices. This tapped into one of the main drivers for this building: to create a center to address key health challenges in Kentucky, such as cardiovascular issues, obesity, diabetes, and others. This crucial insight turned an amenity into a “must-have” research component. With the shift in programming, the University of Kentucky also realized they would have to create spaces for yet-to-be-determined, grant-based researchers and tenants. This unknown tenant-ship forced designers and leadership to consider both flexibility and how best to spend money. As the university realized the value of a more blended research facility in terms of lab type, the research spaces became more universal. HGA’s design team worked with UK leadership to find the right balance of fit-out versus shell space. 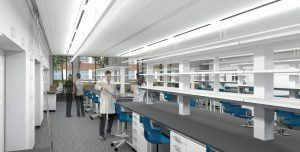 During Phase 1 of the project, HGA and the university fit out two floors of labs, leaving the remaining four floors as core and shell space that can respond to whatever future tenants needed. This solution of finished and open space spent the university’s funds wisely, creating fully functional spaces while capturing the kinetic energy of future research needs and the inevitable changes that come with interdisciplinary research. 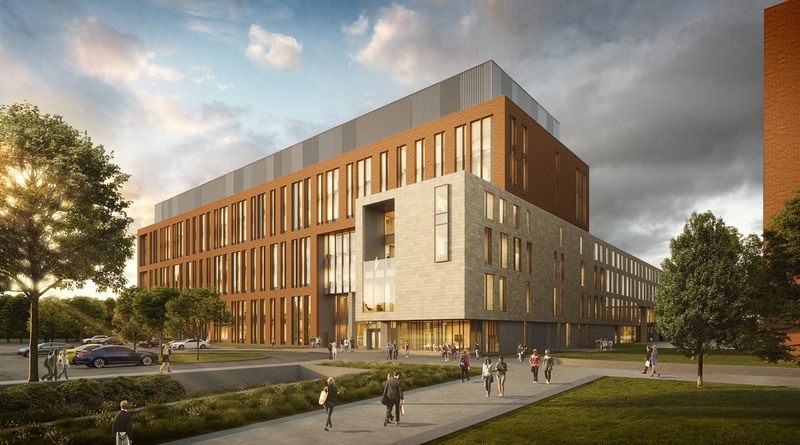 The design process for the University of Kentucky Research Building 2 did not just play a significant role in the project—it fundamentally changed the building and its capabilities. Through the collaborative process of workshops and visioning with university leadership and users of the facility, HGA tapped into primary goals of the University of Kentucky and the Commonwealth at large and revealed unique insights into the aspirations of the university. These insights guided the Research Building 2 project to embrace the future-focused, interdisciplinary potential for solving local problems by developing solutions with a global impact, ultimately creating an enduring legacy for the University of Kentucky when completed in 2018. By shifting to an interdisciplinary solution that combined different types of labs, the University of Kentucky expanded potential users, allowing scientists to work next to nutritionists, economists, and other researchers to tackle health issues from every angle.